Jinkee Pacquiao fashionably trained her kids Princess, Queenie well. The ever youthful Jinkee Jamora Pacquiao recently stepped out in style for their Sunday worship session, with her two beautiful daughters Princess and Queenie. 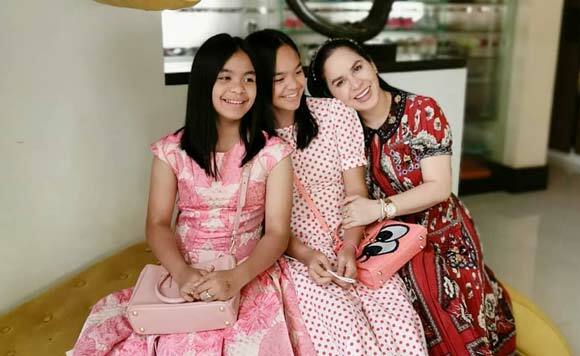 On her latest Instagram stories, the businesswoman and Belo endorser shared a photo of her and kids Mary Divine Grace and Queen Elizabeth clad in pink and red dressed, armed with their own designer bags. ” I Love You Two.  ” , she wrote. Mary Divine Grace Pacquiao was born in 2006 and was the firstborn daughter of the couple. Two years later, her sister Queen Elizabeth Pacquiao, was born in the US, on the same year Sen. Manny won a big fight.